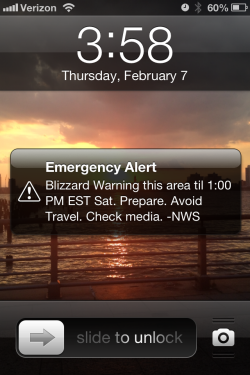 Emergency alert: Blizzard warning text sent to cellphones by NWS. If you live along the Northeastern Seaboard, there’s a good chance your mobile phone buzzed or beeped Thursday afternoon with a text alert like the one shown at left. And if you don’t, there’s a decent chance you witnessed the fallout on Twitter anyway. Why did some people get the alerts while others sitting right next to them did not? Did half the country download some emergency-alert app that they’ve since forgotten about? If you didn’t get the message, does that mean you’re safe? Or doomed? The alerts seem like a great idea in theory, although today’s message wasn’t exactly overflowing with actionable intel. Reactions on social networks and in the newsroom where I’m sitting right now suggest the alert’s most immediate effect was to make those who got it wonder why they did and those who didn’t get it wonder why they didn’t. But hey, here you are finding out the answer. So, if nothing else, hooray for the sage advice to “check media.” Oh wait, were you hoping to learn something about the actual blizzard? Try Weather Underground’s page on Winter Storm Nemo.